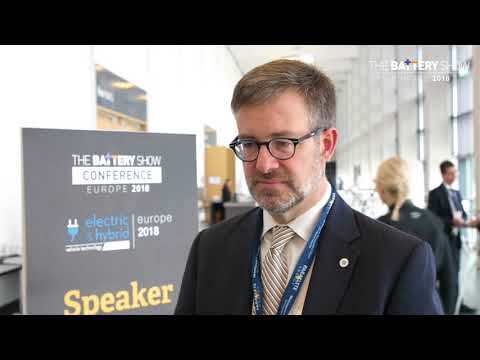 Craig Rigby, advanced market and technology strategist, Johnson Controls Power Solutions, provided a recap on his panel discussion “Driving Progression in Lead-Acid Technology” on the future role of the lead-acid battery. Three of Power Solutions advanced battery technology experts presented at The Battery Show Europe in Hannover, Germany, on industry trends. Each expert provided insights on the battery technologies available today and into tomorrow which help balance regulation, consumer demands and original equipment (OE) economics. “As we focus on the battery technology of tomorrow, today’s market leader, lead-acid technology, will continue to play a significant role in the future of vehicle energy storage,” said Rigby. Read more on this panel in The Battery Show newsletter. The Battery Show is Europe’s largest trade fair and expert-led conference for advanced battery technology. More than 350 manufacturers and service providers from across the supply chain display thousands of design, production and manufacturing solutions, including battery systems, materials, components, testing, and recycling, for the automotive, utilities, renewable energy, grid, power tools and electronics industry. The conference, which runs parallel to the trade fair, , delivers insight into key business and technical challenges while framing the commercial opportunities currently facing global OEMs, battery manufacturers, components providers, stationary storage systems and their supply chains. Johnson Controls Power Solutions is a world leader working in partnership with our customers to meet increasing market demands for energy storage on a global scale. At Johnson Controls we’re shifting our approach from the pervasive “take/make/waste” mentality to one that embraces a circular economy.